"Is It Really Possible to Cure Your Sleep Apnea by Doing Simple, Centuries-Old Yoga Breathing Exercises?" Yoga is all the rage these days. Millions of people around the world are using yoga exercises to reduce stress, increase relaxation, and tone their bodies. But did you know that there are yoga breathing exercises that can help your sleep apnea? The centuries-old practice of yoga includes many breathing exercises that are meant to strengthen the diaphragm and increase oxygen intake. And as you probably know, one of the biggest dangers of untreated sleep apnea is a reduction in the body’s intake of oxygen. Without the right amount of oxygen, we experience fatigue and depression, and low oxygen levels can also lead to serious health conditions such as heart failure. But there is hope! By following the yoga breathing exercises covered in this report, you’ll be well on your way to a stronger diaphragm and greater intake of oxygen into your body. The exercises in this report were written by an experienced yoga instructor specifically for sleep apnea sufferers. So go ahead and dive in! It’s a little known fact that your diaphragm muscles can be a huge help in reducing sleep apnea. How? The diaphragm muscles are responsible for breathing – weak muscles mean your breathing isn’t as strong as it should be. You might have thought yoga is all about people doing unbelievable body contortions like what you see on literature and television shows. But yoga is more than that. It primarily involves meditation and proper breathing. The yoga breathing that this guide covers is the Pranayama yoga, one of the Eight Limbs in the Ashtanga Yoga concept. Pranayama is a Sanskrit word which literally means extension of the breath. Yoga is Indian concept of mental, spiritual and physical workout whose origin dates back to ancient civilizations. Based on the foundational text of Raja yoga, the Yoga Sutras of Patanjali, Pranayama makes one of the eight limbs of Ashtanga Yoga system that primarily revolves around breathing which is, in turn, a sign of life. This guide vividly demonstrates how proper breathing is done through Pranayama yoga to treat your sleep apnea. We live a life that is full of challenges and stressful activities that make us feel exhausted, physically and emotionally, leaving us totally drained the rest of the day. Depending on your system’s ability to cope with the stress, you may experience various stress-related medical conditions such as sleep disorders like snoring, insomnia and restless sleep. Unlike other sleep disorders though, sleep apnea is not caused by stress or any form of external triggers. Rather, it is caused by one of three forms of physical triggers originating from within, namely: central sleep apnea (CSA), obstructive sleep apnea (OSA), and complex or mixed sleep apnea, of which OSA is the most common form that causes this particular sleep disorder. Whatever type of sleep apnea you may have, proper breathing exercise is the key and you can possibly achieve that through Pranayama yoga. In this guide, learn the three basic techniques of breathing that can help treat your sleep apnea. Breathing is a vital function and you don’t even have to practice it, right? Wrong! To treat your sleep apnea, you need to practice proper breathing. This guide will teach you the proper techniques of yoga breathing through a series of exercises which you need to do in stages—in their proper order. The breathing exercises that you will learn from this guide are demonstrated in eight stages, of which each stage explains, in precise manner, every step of the way. So you won’t find yourself scratching head figuring out how to perform each exercise. The first four stages of this 8-stage breathing exercise require you to lie down while the second half requires you to sit down. These eight-stage exercise only require minimal or without close supervision from a yoga teacher. So basically you’re on your own doing these exercises as they are quite simple to do. Stage 1: The goal of this first lying-down exercise is to help you become attentive, invigorate your nerves, loosen up your lung movement and prepare your lungs for deep breathing. Stage 2: This exercise basically teaches you the art of exhalation. Controlled exhalation is emphasized here with the aim of soothing your nerves and calming your brain. Stage 3: This exercise focuses on the art of inhalation. In this stage, you will get to learn an inhalation technique that would invigorate your nervous system. Stage 4: This last of a series of lying-down breathing exercise teaches you how to master your inhalation and exhalation skills, the effects of which are heightened energy and relaxed nerves. Stage 5: This fifth breathing exercise is similar to stage 1, but requires you to sit down instead of lying down. This first sit-down breathing exercise emphasizes the art of observation that will lead to even breathing. Stage 6: Like the stage 2, this exercise will enable you to learn how to lengthen the duration of your exhalation skill while sitting down. Stage 7: This penultimate stage is the sit-down version of the lie-down breathing exercise of stage 3. Here you will learn the art of inhalation while in a sitting position. Stage 8: This ultimate breathing exercise is also considered as the Ujjayi pranayama proper. Here, you will learn how to master your breathing skills the ultimate goal of which is the transmission of life-giving energy to all the vital parts of your body. This guide also demonstrates the four major techniques of sleep meditation that you can do to treat your sleep apnea. These four sleep meditation techniques include: Left Nostril Breathing, Clearing Your Mind, The Power Nap and Progressive Muscle Relaxation. Left Nostril Breathing: As the name suggests, you’ll get to learn how to breathe the proper way through your left nostril by blocking your right nostril with your fingers until you drift to sleep. You will also learn through this sleep meditation technique the concepts of breaths as you go through this exercise. This exercise requires you to assume a comfortable sleeping position on your bed. Clearing Your Mind: This exercise emphasizes deep meditation through visualization of things or events that you have done and what you are going to do. You need to equip yourself any writing implement, but preferably a pen or pencil and a clean sheets of papers. Unused notebook or diary can be a good choice to scribble on your notes as you perform this exercise. The Power Nap: Power nap is thought to be another excellent sleep meditation technique wherein you can adopt to treat your sleep apnea. This exercise doesn’t need more than a simple sleeping position and an equally simple visualization of a clock as your virtual timer while you take your power nap. Progressive Muscle Relaxation: This meditation technique is designed to allow the release of tensions from all parts of your body through progressive concentrations on each group of body parts until you drift to sleep. Looks very helpful, huh? It surely is! Click the "buy" button and download Yoga Breathing For Sleep Apnea: Your Complete Exercise Guide! If you’ve uttered the words “I’m too tired to…” in the past year or so, you are not alone. Some 50 million Americans see the doctor each year complaining of general fatigue. As a matter of fact, fatigue is the next-most-common complaint after colds and flu! 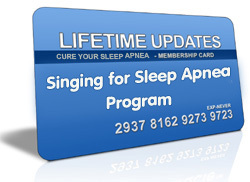 My materials are by far the most comprehensive resource on singing therapy for sleep apnea. However, I believe in constant improvement. I will always continue to research, test and refine what I have learned to make the Singing for Sleep Apnea program even better. "SUPER BONUS – Free One-On-One Counseling With Marc MacDonald For 3 Months (Only a Few Spots Left!)" Valued at $197.00. Yes, free private counseling, advice and guidance from an independent sleep apnea researcher are always just an email away. If in any time you feel confused, you can have your troublesome questions privately answered. I’d love to hear from you. Just email me. I promise you’ll get an answer in 24 hours. This help is practically priceless. You’ll always feel that someone is there for you…so you’re never left to deal with your sleep apnea alone. But because of the exclusive nature of the support I provide to my customers, there’s obviously a limit on the amount of emails I can answer a day. No matter how committed I feel to help other sleep apnea sufferers, this invaluable personal guidance is available for a limited number of people (only few spots are left! ), so order now. Seems impressive? Sure it is, but you definitely want to know what latest research says about tackling with sleep apnea through Yoga exercises, don’t you? A study published in Applied Psychophysiology and Biofeedback found yoga helped relieve chronic insomnia. Researchers at Harvard Medical School in Boston taught 20 study participants yoga breathing, meditation and mantra (sacred sound recitation) in one training session. The participants practiced the yoga treatment before bedtime on their own and with brief in-person and telephone follow ups for eight weeks. The subjects maintained a sleep-wake diary for two weeks prior to treatment and for eight weeks during the treatment period. The participants’ sleep efficiency, total sleep time, total wake time, sleep onset latency, wake time after sleep onset, number of awakenings, and sleep quality measures were assessed from their sleep-wake diary entries. Researchers found that the participants had significantly improved sleep efficiency, total sleep time, total wake time, sleep onset latency, and wake time after sleep onset at the end of treatment compared with before the treatment. “Yoga is an effective treatment because it addresses insomnia’s physical and psychological aspects,” says study author Sat Bir Khalsa, Ph.D., assistant professor of medicine at Harvard Medical School and associate neuroscientist at Brigham and Women’s Hospital, in a statement. A 2012 randomized study, published in the journal Menopause, found yoga helps ease sleep problems and menopausal symptoms in postmenopausal women. All the participants were not on hormone therapy and were diagnosed with insomnia. Brazilian researchers assigned 44 menopausal women with insomnia to yoga, physical therapy stretches, or no treatment for four months. Questionnaires evaluating insomnia, menopause symptoms, anxiety and depression symptoms, stress, and quality of life were obtained from the participants. The yoga and physical therapy groups participated in sessions two times per week. The yoga program included yoga stretches and Tibetan yoga breathing. The researchers found that the yoga participants had significantly reduced insomnia severity and menopause symptoms and improved quality of life and stress resistance compared to the control group. In addition, the yoga group had significantly fewer sleep problems than the physical therapy group. “This study showed that a specific sequence of yoga might be effective in reducing insomnia and menopausal symptoms as well as improving quality of life in postmenopausal women with insomnia,” the study authors conclude. No questions, no hassle - it's that simple! YES, Marc! I want to take my health into my own hands. I’m ready to dive into Cure Your Sleep Apnea With Herbs! 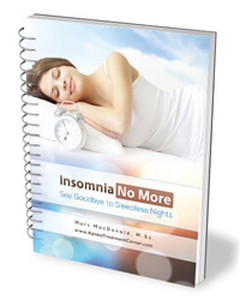 I understand that I will get the "Yoga Breathing For Sleep Apnea: Your Complete Exercise Guide", “Buteyko Breathing Exercises for Sleep Apnea", "Overcome Daytime Fatigue: Sleep Apnea Edition" and "Insomnia No More" Ebooks .